Tokyo (VNA) – Vietnam’s Finance Ministry and Daiwa Corporation of Japan co-hosted a conference in Tokyo on August 21 to promote financial investment in Vietnam with the attendance of more than 200 Japanese firms. Speaking at the event, Vietnamese Finance Minister Dinh Tien Dung said there remains huge room for bilateral cooperation in the financial market, adding that Vietnam’s economy has recorded an annual average growth rate of 6 percent over the past three decades. The country’s gross domestic product (GDP) expanded by an estimated 5.73 percent in the first half of 2017 while its Purchasing Managers’ Index (PMI) announced by the Nikkei has reached a high level in the past 22 months and the highest figure in ASEAN, he said. 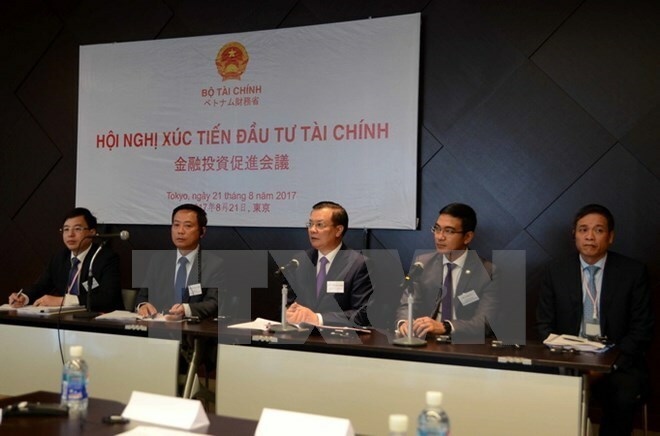 The minister told participants that the Vietnamese government defined developing human resources, improving market economy institutions and developing infrastructure as three breakthrough areas so the country’s demand for capital is huge, especially investment sources accompanied with expertise and development experiences. About the equitisation of State-owned enterprises (SOEs), Dung said 44 SOEs were equitised this year and the figure will increase to 64 in 2018. The Vietnamese government has also launched the derivatives market with VN30 future contract as the first product. Dung expressed his hope that major Japanese financial corporations would invest indirectly in Vietnam, become strategic investors and bring capital and technologies to the country. In an interview granted to the Vietnam News Agency (VNA)’s reporters in Tokyo, member of the Board of Directors of the Daiwa Securities Group Keiko Tashiro said Daiwa will continue investing in the Saigon Securities Incorporation (SSI) and expects to receive more support. Meeting Japanese Vice Minister of Finance Imaeda Soichiro the same day, Dung lauded Japan’s active role in developing infrastructure in Vietnam through official development assistance (ODA) capital over the past years.